Smart jewellery fans will be happy to hear that startup Ringly and its Aries collection of smart bracelets and smart rings are now up for grabs. First announced back in March this year, the Aries collection which includes a host of bracelets, can can handle notification alerts from iOS and Android smartphones. The sleek-looking wearable also works as a fitness tracker to count steps and comes with a two to three day battery life. Treating its wearables like fashion pieces, you'll be able to get your hands on gold plated bracelets and semi precious gemstones including lapiz, tourmalated quartz, rainbow moonstone and labradorite. Two new styles, the Boardwalk and RoadTrip were added to the line in May adding a polished stainless steel option with a pyramid stud either side of a 'Snowflake' obsidian gemstone. The Roadtrip includes a small crystal accent on each side of a 'Blue Lace' agate gemstone. If you don't fancy a bracelet, there's a Ringly Aries smart ring as part of the new collection as well, which will be available in a variety of different finishes including an 18k gold version and a gunmetal stainless steel option. Ringly first appeared on the scene when its CEO Christina Mercando d'Avignon unveiled a smart ring. When we spoke to d'Avignon about her new collection she told us: "We get requests all the time but bracelets was by far one of our biggest requests. From day one, it was always our mission to create accessories that were smart but we wanted to nail the small form factor first." 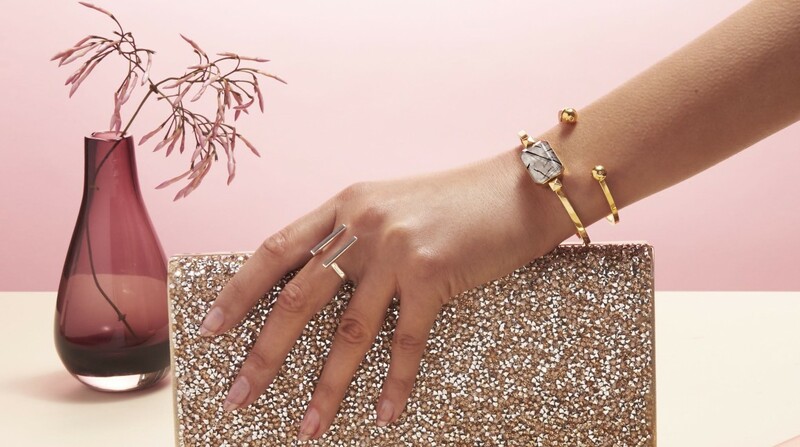 You can take your pick from the collection on the Ringly's online store now with prices starting from $245 for the bracelets and $195 for the smart rings.